Have you ever dreamed to travel through the time and to find yourself in the dale of Mexico where city of Aztec’s spreads out with majestic pyramids and golden temples? This ancient design masterpiece still keeps the mysteries of one of the greatest civilizations of the world. So, get ready to walk about the Tenochtitlan and to reveal the secrets of this ancient city. 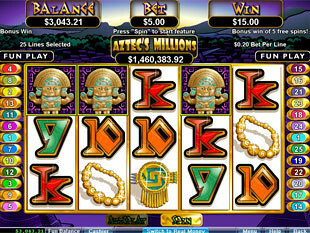 Aztec’s Millions slot machine has 5 reels and 25 paylines. Powered by RTG it can boasts of great design, high quality graphics and utterly exciting bonus game. 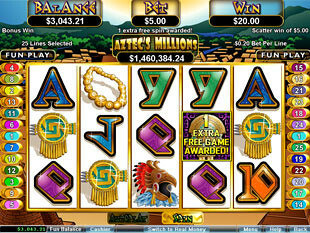 Moreover, this slot gives you an excellent opportunity to win progressive jackpot. So, this game is really noteworthy. You should know what special symbols will help you to find Aztec’s treasure that is already waiting for you. The wild symbol is Aztec King. This symbol plays special role by replacing symbols lacking in the winning combination. Wild symbol appears on reels 2, 3 and 4 and substitutes for all symbols excepting scatter Idol and Aztec’s Millions. Scatter symbol is Idol that can make winning combination independently on the active lines. To be more exact, this symbol appears on reels 3, 4 and 5 but it can be scattered anywhere on these reels. The maximum scatter win constitutes $500. Moreover, this symbol triggers Free Spins. This game has fixed coin size – $0.20 and all 25 lines are active so, minimum bet is at the same time maximum one – $5.00. 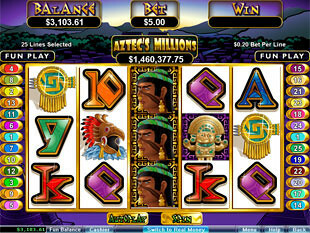 To win top jackpot of 5,000 coins or $1,000 you should catch 5 Aztec’s Princesses on one of the active lines. 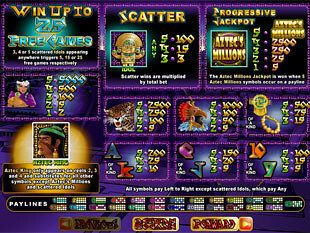 Aztec’s Millions slots also offers you progressive jackpot that can be won on condition that you catch 5 Aztec’s Millions logos on one of the active lines. Any player is quite impatient for the bonus game to begin. As it was noted above, Idol symbol trigger this exciting round. To activate this game, you should catch 3 or more scatter symbols anywhere on reels 3, 4 and 5. You will be awarded with 5, 15 or 25 Free Spins for 3, 4 and 5 Idols respectively. Moreover, you will be awarded with one additional Free Spin if Idol symbol appears during the feature. So, you can win much more than 25 Free Spins. One more pleasant surprise it that all wins are tripled during this bonus round. So, you have chance to win tripled top jackpot of $3,000. Aztec’s Millions slots is pulse-pounding game that invites you to visit ancient Aztec’s city and to enter great pyramid where wise chiefs have hidden enormous treasures.